Throughout the world, traffic levels are increasing and, in urban areas, these increasing levels have led to pressures on the road networks which are causing serious economic, environmental and social problems. 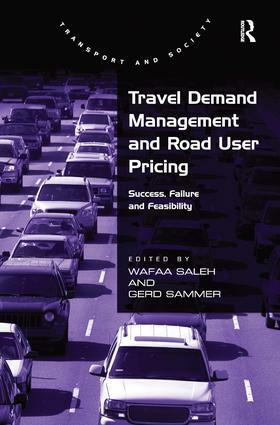 This book examines the full range of 'push and pull' Travel Demand Management measures. This covers areas of regulatory, pricing, planning and persuasive policies to encourage individuals to make their trips in off-peak periods, by a different mode or to find another way of carrying out the trip purpose. Applying such measures can result in a more efficient transport system, improved environmental conditions and improvements in safety as well as revenue generation for use on alternative transport systems. The editors conclude with a summary of findings within the book and suggestions for best future practice. Contents: Editorial: travel demand management and road user pricing: success, failure and feasibility; Part I Travel Demand Management: Investigation of Impacts: Non-negligible side effects of traffic demand management, Gerd Sammer; Validation and comparisons of choice models, Stefano de Luca and Guilio Erberto Cantarella; On-street parking pricing: ex ante ex post profile analysis following a 50% increase in on-street parking charges in Dublin city, Andrew Kelly and Peter Clinch; Modelling impacts of tolling systems with multiple user classes, Kathryn Stewart; The network society and the networked traveller, Kay W. Axhausen, John Urry and Jonas Larsen; An evaluation of future traveller information system and its effectiveness in demand management schemes, Amy Weihong Guo, Phil Blythe, Patrick Olivier, Pushpendra Singh and Hai Nam Ha. Part II International Experiences with TDM Measures: Variable message signs: are they effective TDM measures?, Wafaa Saleh, Craig Walker and Chih Wei Pai; Transantiago: the fall and rise of a radical public transport intervention, Juan Carlos MuÃ±oz, Juan de Dios Ortuzar and Antonio Gschwender; Unexpected delay and the cost of lateness on I-394 high occupancy/toll lanes, Nebiyou Y. Tilahun and David M. Levinson; Integrated network improvement and tolling schedule: mixed strategy versus pure demand management, Barbara W.Y. Siu and Hong K. Lo; Traveller responses to Stockholm congestion pricing trial: who changed, where did they go, and what did it cost them?, Joel P. Franklin, Jonas Eliasson and Anders KarlstrÃ¶m; Travel demand management measures: technical answers or political gains? Closing remarks, Gerd Sammer and Wafaa Saleh; Index.